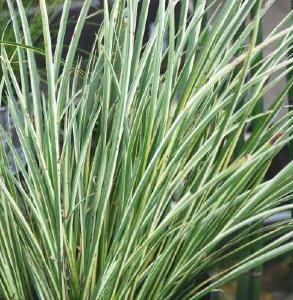 Acorus gramineus 'Variegatus' is a stunning cream and white variegated plant with tufts of sword shaped leaves. The plant is semi evergreen depending on the severity of the winter. It prefers wet or moist soil but is easy to grow in any fertile soil. Grow in full sun to retain the bright foliage. An ideal plant for containers. Height 50cm, spread 50cm. Supplied in a 9cm pot.